Though you may be healthy in all other respects, imbalances or disruptions of natural male functions can occur that undermine feelings of wellness and male vitality. For centuries, master herbalists have known that men have unique needs and that certain herbs work to balance and support normal masculine function and improve wellness and vitality. 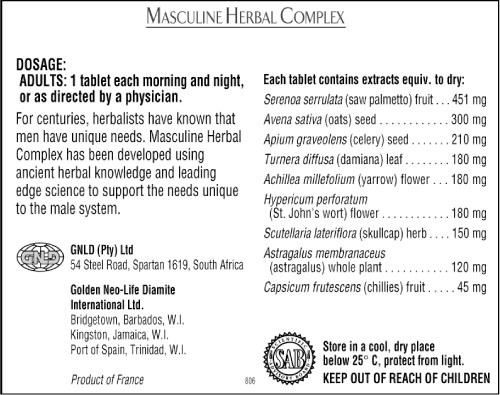 GNLD developed Masculine Herbal Complex using ancient herbal knowledge and leading-edge science to support needs unique to the male system. Why Choose Herbs for My Male Concerns? 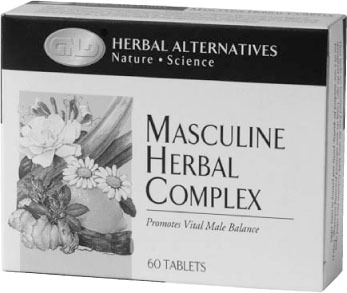 Because herbs naturally and gently balance and support normal male physiology and function. Because herbs have been shown to support and enhance masculine needs and help the male body perform at its vital best. Why GNLD Masculine Herbal Complex? Comprehensive formula. Our unique “complete family” approach to the formula provides broad, synergistic effects of the herbal constituents, which optimize their ability to promote vital male balance. Contains Saw Palmetto which has been shown to help support the function of the prostate. Contains St. John’s Wort and Skullcap which help support calmness, relieve low mood and support positive mental attitude. Contains Damiana for boosting vitality. (Serenoa serrulata/repens) Assists in boosting vitality and supporting the function of the prostate. (Avena sativa) Helps relieve feelings of nervous stress and mild anxiety. (Apium graveolens) Supports and balances normal male physiology and function. (Turnera diffusa) Supports and promotes normal male physiology and function. (Achillea millefolium) Reduces inflammationand supports the function of the circulatory system. (Hypericum perforatum) Reduces inflammation and assists in relief from mild depression. (Scutellaria lateriflora) Assists in relief from feelings of nervous stress and mild anxiety and overcomes muscular spasms. (Astragalus membranaceus) Assists in boosting vitality, promotes kidney function. (Capsicum frutescens) Assists in promoting the function of the circulatory system. Chevallier, A., Encyclopedia of Medicinal Plants, Dorling & Kiindersley Ltd., London, 1996. Hoffman, D., The Complete Illustrated Holistic Herbal, London, 1996. Hsu, Hong-Yen, Oriental Materia Medica, Keats Publishing Company, New Canaan, CT, 1986. McIntyre, A., The Complete Woman’s Herbal, Gala Books, Ltd., London, 1994.